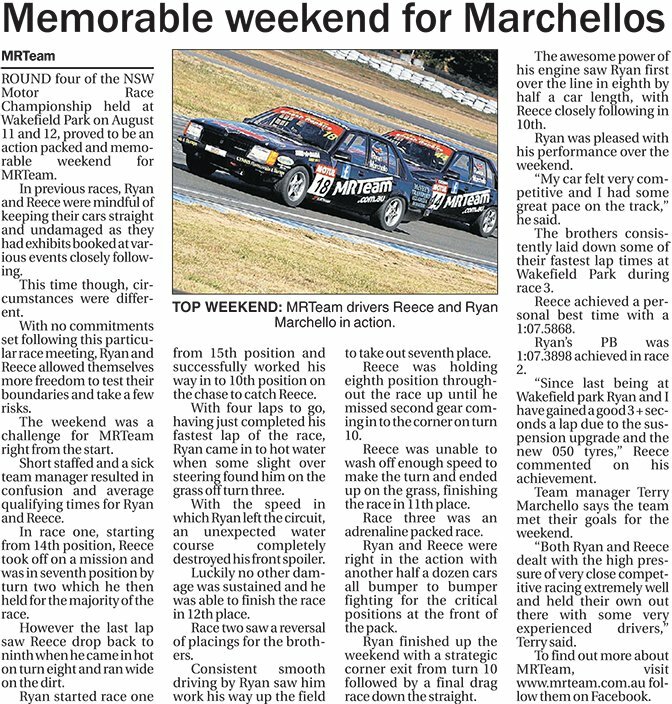 ROUND four of the NSW Motor Race Championship held at Wakefield Park on August 11 and 12, proved to be an action packed and memorable weekend for MRTeam. In previous races, Ryan and Reece were mindful of keeping their cars straight and undamaged as they had exhibits booked at various events closely following. This time though, circumstances were different. With no commitments set following this particular race meeting, Ryan and Reece allowed themselves more freedom to test their boundaries and take a few risks. The weekend was a challenge for MRTeam right from the start. Short staffed and a sick team manager resulted in confusion and average qualifying times for Ryan and Reece. In race one, starting from 14th position, Reece took off on a mission and was in seventh position by turn two which he then held for the majority of the race. However the last lap saw Reece drop back to ninth when he came in hot on turn eight and ran wide on the dirt. Ryan started race one from 15th position and successfully worked his way in to 10th position on the chase to catch Reece. With four laps to go, having just completed his fastest lap of the race, Ryan came in to hot water when some slight over steering found him on the grass off turn three. With the speed in which Ryan left the circuit, an unexpected water course completely destroyed his front spoiler. Luckily no other damage was sustained and he was able to finish the race in 12th place. Race two saw a reversal of placings for the brothers. Consistent smooth driving by Ryan saw him work his way up the field to take out seventh place. Reece was holding eighth position throughout the race up until he missed second gear coming in to the corner on turn 10. Reece was unable to wash off enough speed to make the turn and ended up on the grass, finishing the race in 11th place. Race three was an adrenaline packed race. Ryan and Reece were right in the action with another half a dozen cars all bumper to bumper fighting for the critical positions at the front of the pack. Ryan finished up the weekend with a strategic corner exit from turn 10 followed by a final drag race down the straight. The awesome power of his engine saw Ryan first over the line in eighth by half a car length, with Reece closely following in 10th. Ryan was pleased with his performance over the weekend. “My car felt very competitive and I had some great pace on the track,” he said. The brothers consistently laid down some of their fastest lap times at Wakefield Park during race 3. Reece achieved a personal best time with a 1:07.5868. Ryan’s PB was 1:07.3898 achieved in race 2. “Since last being at Wakefield park Ryan and I have gained a good 3 + seconds a lap due to the suspension upgrade and the new 050 tyres,” Reece commented on his achievement. Team manager Terry Marchello says the team met their goals for the weekend. “Both Ryan and Reece dealt with the high pressure of very close competitive racing extremely well and held their own out there with some very experienced drivers,” Terry said. To find out more about MRTeam, visit www.mrteam.com.au follow them on Facebook.